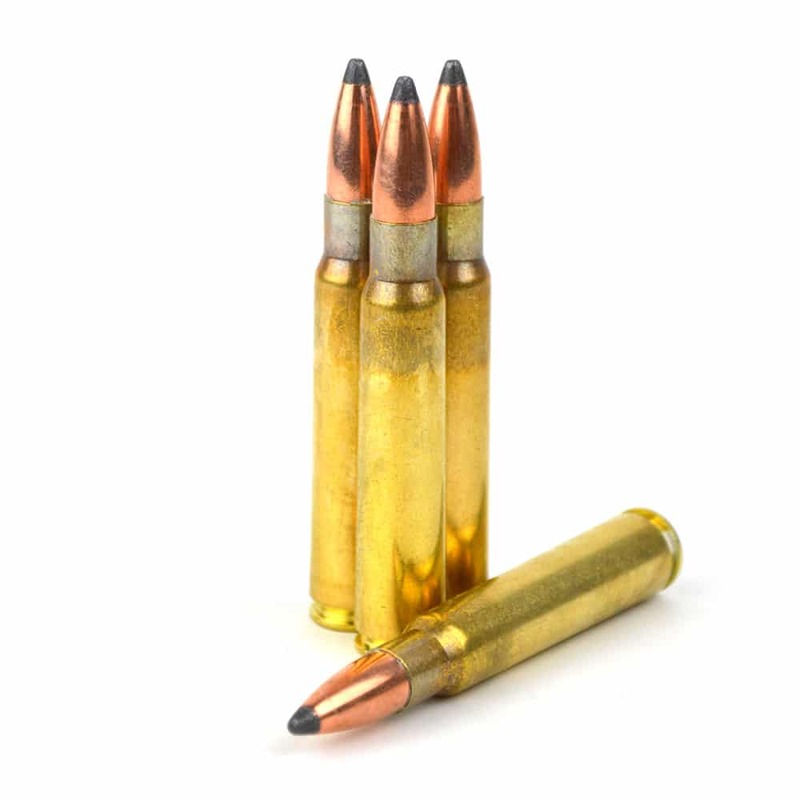 This 7.7 x 58mm load is a low-pressure round designed for your vintage military rifle. At 150 grains accelerated to 2,310 fps (26″ barrel), it is easier on your shoulder and your old Arisaka. This is a great way to exercise that old Type 99 rifle. This Speer spitzer soft point can also be used to take deer-sized game at shorter distances. Warning: If you have not yet fired your Type 99—please inspect your rifle before shooting. If there is no rifling present, you are likely in possession of a training rifle. These training rifles were designed only for extremely low-pressure BLANKS, and firing live cartridges such as these WILL result in injury. Shooting my Arisaka for the first time (and its first time in almost 80 years, according to my uncle who brought it back from the PTO) with this ammo was a pleasant surprise both from the resulting consistency and accuracy AND a welcome relief for my shoulder! The photo is from a bench rest at 50 yards. Great stuff! I purchased this to shoot in a Japanese Arisaka Type 99 paratrooper rifle. Considering it’s age, the rifle is close to perfect and even has all of it’s original Japanese markings still intact. The Steinel 7.7 x 58 shot perfectly. Now when I decide it’s time to take this old relic out to shoot I know I have a dependable source of ammo for it. Absolutely flawless, from the shipping time, to the packaging, to the ammunition. It’s good to enjoy the little things, and Steinel’s attention to detail makes that possible. First time buyer but will definitely be spending more money here. I harvested an eight-point deer this year utilizing the Steinel 7.7 with excellent results. The entry hole was the width of the bullet, but the round exited the deer with great expansion. The shot was at a distance of 50 yards, and the exit hole was about 2″x3″. The lungs were both shredded and the top of the heart was hit as well. Shooting for groups, I was consistently able to achieve 1.5″ to 2.5″ groups at 100 yards. The recoil is pleasant. This is some of the most affordable 7.7x58mmJap on the market, and the quality speaks for itself. Just received my 2nd order of 7.7x 58 Jap. Thanks for the sticker. Looking forward to the new stickers. Type 99 ammo are hard to find these days. Found this product on ammoseek and it has fired and cycled through my arisaka without a hitch. These are great reloads with good accuracy. Cheapest 7.7 box you can find. Steinel Ammo Co. (formerly Xcaliber) 10/9/17: we’re glad you enjoyed these! Please keep in mind xcaliber loads all ammunition with new, virgin brass unless otherwise noted. Just got model 99, didn’t know what to expect. 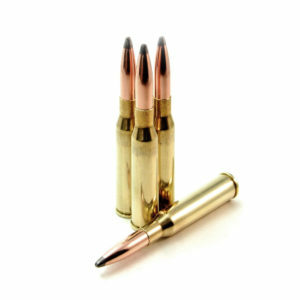 With your 150 light recoil soft point rounds it shot awsome! Open sights and my 58 year old eyes ,shoot accurately at 100 yards. My arisaka has the best trigger of all my guns. The XCaliber 7.7mm X 58 ammunition for my vintage Arisaka Type 99 is a 150gr. 2,310 FPS round that works perfectly in this rifle. I rely on XCaliber for quality ammunition that I can trust. I only use this rifle periodically for target shooting and it has special meaning to me since my Dad brought this rifle (along with a 6.5mm Arisaka Type 38) back from the Pacific after the War and it is important to me and my brothers that nothing damages these rifles. I only wish that XCaliber would produce the 6.5 rounds for my other Arisaka. Good, hard to find ammo. Highly recommend. Customer service was excellent, As a first time buyer on Steinel Ammo (XCaliber) they were quick and efficient in the processing of my documentation. The ordering process was also very user friendly and they responded in near real time to my email questions. The Ammo is of superior quality and caused no issues with my Type 99 (Mid war years model). Very satisfied with this product in both price and quality and will be purchasing more. I recently acquired an Arisaka Type 99 Short Rifle that was made in 1941 at Kokura Army Arsenal in Kyushu, Japan. Since I am not a handloader, I decided to give Steinel (XCaliber) 150 gr. ammo a try. I was pleasantly surprised that it is accurate without unforgiving recoil In comparison with other commercial ammo with 170 gr. bullet, I believe the manageable recoil aided the accuracy. Bought a box of this 7.7 to shoot my arisaka for the first time. It had been more than a year since I bought it but now was my first chance to shoot it. Let me tell you, this stuff shot like a dream. Hardly any kick from a larger caliber (thanks to the lower pressure load). Even after shooting 20 rounds through, I didn’t see a spec of residue from the burnt gunpowder left over. It burns very clean and loads extremely well into my rifle. This ammo is the best. Shot a 2 inch group at 100 yards. So incredible to make my type 99 talk again after what might have been 70 plus years of silence. SAC reponse: 4/16/18- very glad to hear of your experience! There are so many new and glamorous calibers out there now. It really is rewarding to throw some lead downrange from a gun and cartridge that saw its heyday nearly 8 decades ago. It’s also uniquely rewarding to handle and fire a weapon with so much history. Glad someone is making 7.7mm rounds for my Japanese Arisaka Type 99. Rounds worked flawlessly at the range. Nice groupings. My grandfather gifted me a type 99 arisaka that was brought back from wwii before he passed in 1991. The gun sat unused in a closet for at least fifty years. I finally had the chance to clean and inspect the rifle, which is an early production model made at the naguya arsenal. The bore and mechanicals were still in great shape so I decided to test it out. Xcaliber rounds worked flawlessly and I got nice groupings from 75 yards considering I wasn’t using a vice with standard peep sight. Thanks! My grandfather brought a Japanese Arisaka back from Iwo Jima. It spent probably close to half a century rusting in the rafters of the garage until he passed. I’ve had it restored but the last time if was fired, it was pointing at US Marines. The lighter 7.7 load was perfect for testing out this old rifle at a reduced pressure to ensure that it functioned safely Many of the late war production models have been known to have issues with adequacy of the barrels. XCaliber ammo gave me a little peace of mind easing the rifle back into good working order. Fantastic performance that brought this family heirloom back to life. Can’t say enough. Shot great! My Arisaka boomed to life after 70+ years of silence. Excellent place to buy from and quality ammo..
5 out of 5	JAP ARISAKA BROUGHT BACK MY FATHER IN WWII. I SHOT THE JAPANESE RIFLE WITH 7.7 150 GRAIN BULLETS TO MINIMIZE ANY POTENTIAL ACCIDENTAL EXPLOSIONS FOR FIRST TIME USE IN 75 YEARS. THE AMMO WORKED FINE, NO CRACKS IN THE SHELL CASING. 5 out of 5	AFFORDABLE, AND PACKS A PUNCH. Smooth action, cartridge loads/ejects without any hickups. Accurate for my needs, consistent results over the 20 shots I took on my first use. Will buy again. This was ammo was perfect. Cycled through the action smoothly, fired flawlessly. Thank you for providing this unique caliber ammo in such good quality. I used ammoseek.com to search for this round and you had the best price and delivered quickly. The ammunition looked and shot good. This ammo does not shoot as accurately as the 174gr. FMJ in my Jap Type 99 1941 rifle. XCaliber 7/16/17- Thanks for the input, Darryel. Thanks for your business, and we hope to hear from you again. Worked sweet! It was nice to make the Arisaka talk again. You guys are one of the only places I found that manufactures and sells ammunition for it.